A customer is installing a wheel for a 1996 Peterbilt T&T. It is a Luxury wheel. He cannot get the 914 to go all the way down. Customer tried an 814, just to see if it was the right hub and it worked fine; but the 914 does not. Use the 913 as it has exactly the same shaft dimensions as the 914 but the hub has a small taper machined just below the splines. This worked every time when this issue came up with the 914. The Chinese 814 hub doesn't have any taper to it, but it has the same bore as the large end of the Luxury hub taper (namely .973”) and that is why it would fit. Then, physically speaking, how can a #918 Generation 2 Smart Hub adaptor fit 2000 - 2006? With that said, why won't it also work on Kenworth models dating back to April 1997 and right up to today. Why do we additionally need a #965 Generation 3 Smart Hub. At first glance I would have to say that they probably used 3 different columns on the standard vehicle (without the Smart option). The ones with the Smart wheel used the Douglas Autotech column that was made with all the circuitry in them for the Smart pad that was sold to them thru VIP. 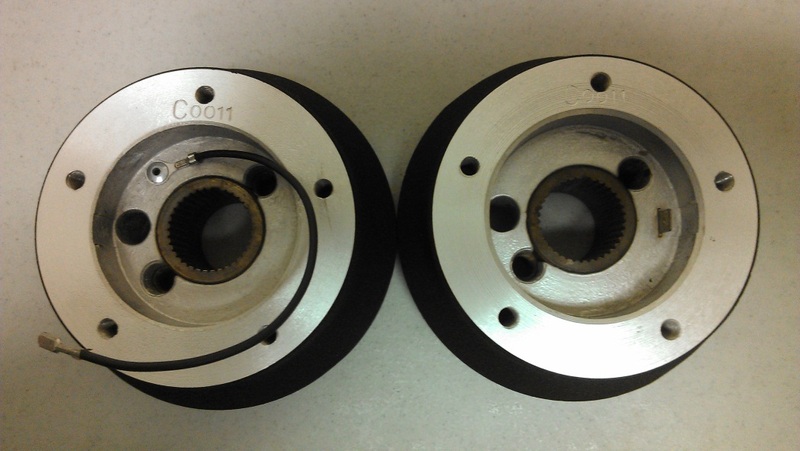 The 916 and 917 hubs fit a 40 spline shaft while the 965 fits a 36 spline shaft which they went to with the Gen 3 column. A customer has a 97 Peterbilt T&T. The customer bought a Trucker 4 and a 914; after this was installed the T&T wouldn’t work. He said the hub wouldn’t go down onto the shaft easily and he had to beat it on. The only thing I have run into over the years is that some of these shafts have a small taper just below the spline area on the shaft. The 914 hub does not have any taper; it is straight so the hub doesn’t want to go all the way on. I suggest he tries the 913 hub as it has the same spline dimensions as the 914, but it has a slight taper that should allow the hub to go onto the shaft properly. Does the dual horn button pad always come with the same hub like the Gen 2&3 pads? Or can there be a couple options? There was a pad offered by Grant/Victor that had 2 horn buttons located on either side plus the center horn button. I think this was for the Volvo truck with 2 horns (one city, one highway) and you could then wire up one (say the center button) for the city horn and then the 2 other buttons on the pad for the highway horn. The pad was sold by itself, not with any hub so it was a standalone item. A customer is looking to get a Classic Blue Steering Wheel for his 1970 Chevy P-10 Step Van. Does he need to get a new hub adaptor and if so which one? Please look at the pictures included. We currently do not have a hub kit solution for the P-Van or Step Van. This would use a Grant Hub kit 3162; but it does not support our bolt pattern. We are working on an adapter/spacer option to connect that hub to our steering wheels. We do not have a production date yet. What is the difference between 816 & 817 and 916 & 917? The later model Kenworth and Peterbilt trucks have too large a nut on them which needs to be replaced with a smaller one. SCI adds this nut to the #816 kit thus making it a #817. The #916 was retooled to allow for this change and that new part is the #917. There are also two other differences. The height of the adapter hub, the 916 is taller by about .800” and the 916 has a molded tab on the bottom of the plastic contact ring for the horn to allow for turn signal cancelling, while the 917 does not have his provision. All one has to do is to remove (cut off) this small plastic tab on the 916 if the column mechanism does not need it for the 917 applications. 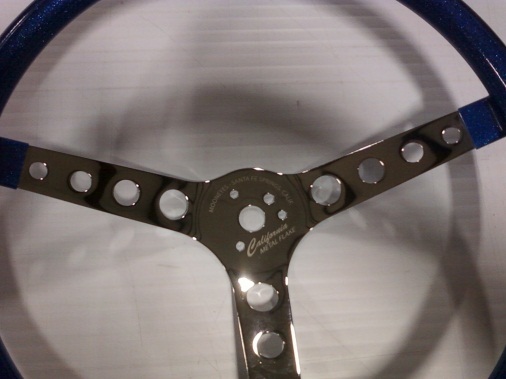 This customer is looking for a hub for this steering wheel (picture below) for a 1966 Ford F650. Looking at the wheel he bought, none of the Victor kits would work as this wheel is for the Grant pattern. Short of him trying the Grant kit for a 1966 F150 (kit number 3285) I don’t have any other solution for him. A customer bought a Grant Driver Series Steering Wheel #12100, along with a 915 hub kit for a KW 1999 T2000. The customer claims that the 915 is too big; that it does not fit over the teeth. What would you recommend? Someone may have changed out the column as they did not use the smaller shaft until March of 2001. The smaller shaft is found in kit number 916 and I believe that is the one that will fit this vehicle. How do you clean the polished aluminum spokes? He said that he used a glass cleaner, but that only made them cloudy with a film layer. The best thing to use is a microfiber cloth similar to what is now commonly used to clean touch-screens on iPads and the like. At Grant we used to tell the customer to use a high quality NON ABRASIVE metal polish with a micro fiber cloth. For a better luster you can use Jeweler’s rouge (after the afore mentioned polish) with a fine micro fiber cloth to get a higher quality shine. The customer has a 1984 GMC Top Kick 7000. Which hub would work for him? The number for this hub is 950. This hub will only have the 5-bolt mounting pattern on it, so if he wants to use a Chinese wheel he will need the 3-5 adapter ring. A customer has a 1988 Autocar; what hub should he use? Earlier this year we used a 913 for a 1990 Autocar, this should work on the 1988 as well. They have simply attached the ground wire to the hub with a blind rivet instead of having the wire connector cast in. Either way it will work although I like the one with the wire attached as it eliminates any confusion by the installer as to how to hook it up and ensures there is a positive ground for the horn button.